SPLIT CUSTOM PROJECT FIND: WHAT A FIND! ALL THAT HAPPEND LAST YEAR. AFTER A WEEK OF RAIN, MY FRIEND AND E11 MEMBER, RENE WAS CLOSE TO SUICIDE. EVERYTHING AT HIS BODYSHOP WAS AFLOAT. 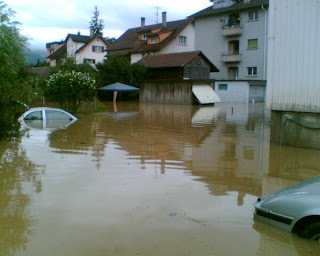 MORE THEN 40 USED CARS WERE DESTROYED BY WATER & MUD! THE WHOLE WORKSHOP, ALL TOOLS, TEST STAND FOR BRAKES AND INVENTORY WAS GONE ( TO HELL ). WITH HELP OF FRIENDS ALL WAS CLEANED UP AND RENEWED. BEHIND THE BODYSHOP RENE ALSO HAVE HAD GARAGES WHICH WERE USED AS STORAGE FOR SPAREPARTS. 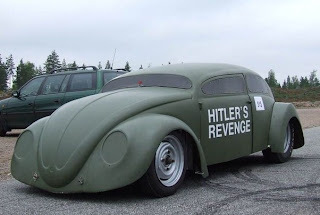 TO CUT A LONG STORY SHORT...........WE FOUND A VOLKSWAGEN BUG BEHIND ALL THE MESS. THE CAR REALLY WAS SNOOKERED AT THE FIRST VIEW. BUT SURPRISE SURPRISE...AFTER A GOOD CLEAN UP AND SEPERATING THE BODY FROM THE CHASSIS WE DISCOVERED A ALLREADY WELDED, MODIFIED CUSTOMCAR PROJECT. THE CHASSIS WAS PAINTED IN GLOSSY BLACK , FITTED WITH ALL NEW PARTS LIKE, NARROWED AXLEBEAM, DROPPED SPINDLES, HIGH TECH BILLET BRAKES, PROFLYER TRANS ETC.ETC ! THE BODY HAD SOME MODS LIKE, ROUNDED DOOR EDGES, NO MORE DOOR HINGES, SUICIDE DOORS WITH NO DOOR HANDLES, RAIN GUTTER REMOVED, NO MORE TRIM HOLES ETC.ETC ! WE ALSO FOUND A COMPLET CUSTOM TWEED INTERIOR, COMPLET ENGINE AND ALL THE SPARE PARTS U NEED FOR ASSEMPLING THE SPLITY. MEANWHILE, E11 MEMBER AKKY BOUGHT THE CAR AND IS ON THE WAY TO FINISHING THE CUSTOMIZED - RESTORED - 90s STYLE - HIGH TECH SPLITWINDOW. 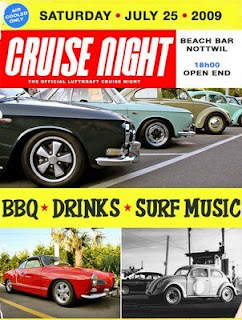 CRUISE NIGHT 09: DONT MISS THE ,, LUFTKRAFT ,, 09 CRUISE. LAST YEAR IT WAS A BLAST................WHAT WILL IT BE THIS YEAR? 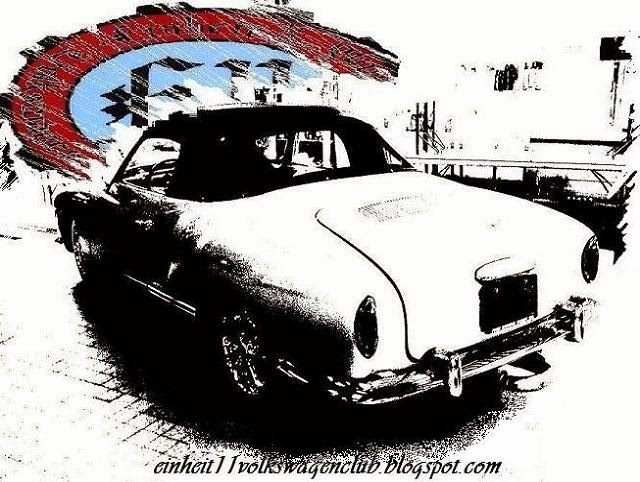 JAPAN IMPORT: SEEN ON THE AUTOBAHN DIRECTION BASEL. ADOLF STYLE: DONT PUT THE BLAME ON ME! BUT THIS PART IS ONE GOOD THING, THE ,, DAS DRITTE DEUTSCHE REICH ,, DID TO THE ,, DAS VOLK ,, ! SPLIT TRIP: IS THERE MORE FUN THEN CRUISING IN A PANSCRAPING 47 SPLIT? I WANNA HAVE ALL 3 OF EM: NO MORE COMMENT.